Every year, since 1785, Bristol, Rhode Island, has hosted an Independence Day celebration, which makes the town title to the Oldest Continuous Celebration in the United States. Bristol happens to be the next town to the north of Portsmouth, where our headquarters are located, and Hodges happens to play a small part in the festivities. Besides having resident Bristolians (that’s what they call people from Bristol) work in our office, Hodges has made the buttons for the town’s art contest since 1992 . We scan in the winner’s artwork and shrink it down to button size. This year’s winner (shown on left) is 8-year-old Bowen of Colt-Andrews school. 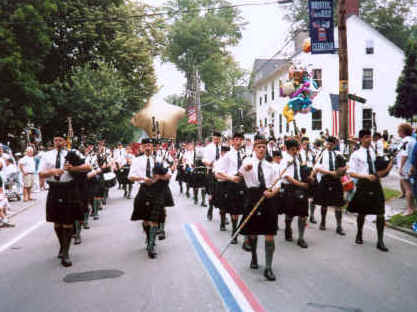 Besides the button contest, the town celebration is probably best known for its parade, which attracts visitors and performers from across the country. There is also a concert series, carnival, pageant, 4th of July ball, orange crate derby, an d visiting Navy ship, not to mention that the town’s main streets are painted with a red, white and blue stripe. If you’re in New England, or will be for the Holiday weekend, you can find the full slate of events on the town committee’s website, www.july4thbristolri.com. No matter where you are, I hope you enjoy the 4th! This entry was posted in Hodges Badge Company and tagged 4th of July, Bristol, buttons, parade, Rhode Island. Bookmark the permalink.